How would you feel if you ever meet Robert Boyle? Discover the life and works of one of sciences greatest names that ever lived on this earth. Robert Boyle was born on January 26, 1627, in Munster, Ireland. He was the fourteenth child and the tenth son of the very wealthy Earl of Cork. There was never any ques¬tion that he was extraordinarily bright. In addition he enjoyed the tremendous advantages that an enlightened parent with great wealth can supply. He learned Latin and French along with English, and later on added Hebrew, Greek, and Syriac to his language arsenal. These enabled him to make extensive studies of the Bible in its original languages. When he was eight he entered Eton College, the largest and most famous of English preparatory schools. He was taken out of the school after three years to tour the Euro­pean continent. This kind of a tour was considered the final polish for an English gentleman, but rarely was this taken by an eleven-year-old. In 1641 the fourteen-year-old Robert visited Italy and came under the influence of the famed Galileo. Boyle decided that he would spend his life in science. Back in England, he entered Oxford, then the leading center of scientific study in England. At Oxford, Robert Boyle found himself among an informal group of brilliant scholars who called themselves the "Invisible College." In 1660 the king granted these scientists a charter, The Invisible Society became the Royal Society. These men were devoted to the scientific experimental method. Truths could be gained only from experience and experiments. 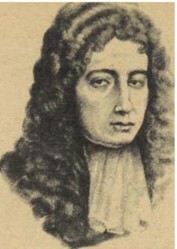 Boyle, an experimental scientist, is celebrated as the author of Boyle's Law, a mathematical formula that tells how gases behave under pressure. Boyle's Law was dis­covered experimentally and only later was it translated into its mathematical form. This is how Boyle conducted his famous experiment. First he had prepared a glass tube in the form of a letter J with the shorter end of the J closed. This was a long tube. The long side was more than ten feet tall. The experiment­ers couldn't fit it into the room so they had to use a stairwell. He carefully poured some mercury into the tube so that the level was the same on each side of the bend of the tube. The pressure of the gas in the closed section was now the same as the pressure of the atmosphere in the open section. You can see that if one side had a greater pressure than the other the mercury would not stand even. These scientists knew well the materials they were working with; the bottom of the J tube rested in a large box. If the glass broke (and it did several times) the box would catch the quicksilver. Now that the mercury stood even, he pasted scales, strips of paper marked in inches and in eighths of an inch, on each side of the tube. Mer­cury was poured slowly and carefully into the open end. The level of the mercury increased on both sides of the tube, but unevenly. The air in the closed section was com­pressed by the mercury and therefore resisted the mer­cury; thus the level on the open side was higher than the level on the closed side of the tube. But in spite of the difference in levels there was a balance. The pressure of the air on the inside depends on the height of the column of mercury in addition to the normal atmospheric pressure. The volume of compressed air can readily be figured out from the measurements of the cylinder. Boyle found an interesting thing: when the long side had 29 inches of mercury more than the short side the volume of the gas was exactly half of its original value! Boyle knew that the atmosphere itself had pressure and he knew that the pres­sure was enough to support a column of mercury 29 inches high. The additional 29 inches had doubled the pressure on the air in the closed section and this doubled pressure had cut the volume in half. Of course he didn't stop; he made hundreds of measurements. A column of mercury almost eight feet high compressed the air into a quarter of its volume. What Boyle found to be true about pressure and volume is now used by every chemist and physicist and is known as Boyle's Law: "The volume of a gas is inversely propor­tional to the pressure." Later scientists, notably Jacques Charles, added the phrases "providing the temperature does not change." Many of Boyle's experiments and discoveries are de­scribed in letters to his nephew, who became the Earl of Cork. These letters sometimes ran to more than a hun­dred pages. Like other great scientists, Boyle was interested in many branches of science. He investigated the speed of sound, the reasons for color, crystal structure, static electricity. He came close to discovering oxygen. He had developed a vacuum pump (man driven) and used to show that an animal could not live in an air-free space. He showed that sulphur would not burn if heated in a vacuum. Boyle is credited with a definition of a chemical element which comes close to present-day theory. He defined an element as a substance "incapable of decomposition," and like a true scientist, added the prophetic "by any means with which we are now acquainted." Elements have been changed in the atomic laboratories of today. Robert Boyle was a generous man, and if he had not discovered Boyle's Law might well live in history as the benefactor who paid the publication costs for Newton's "Principia." He died in London on December 30, 1691. He was 64 years old. Born into an age of superstition and belief in witchcraft, he made notable advances in science and scien­tific method. He provided his contemporaries with inspira­tion and support. Their tribute was, "Robert Boyle smells the truth." As a chemist by education, I am familiar with Boyle's law and ideal gas equation. It's not useful for natural science only, the main idea, based on experimental data leading to theories and laws is useful in virtually all areas of human's life. Thanks for this interesting article about Robert Boyle. Apart from 'his' equation, I knew very little about him. We too often forget the people who produced the laws, on which today's industry is standing. They often lived very exciting and dangerous lives. I never heard of Robert Boyle, your article is educational and enlightening. Thanks.